A tiny library with three simple blocks that make it easier to move around, especially for younger children: simple_movement.xml (3.7 KB). All movement is relative to the beetle's orientation, so if we're upside-down and ask it to walk upwards, it'll actually move downwards relative to the absolute axis. Added default values to all the fields (as a rule of thumb, we should always design blocks with reasonable defaults, and if possible, that you can click on in the palette with a visible result). Left and right were reversed in the turn block, so I fixed that. 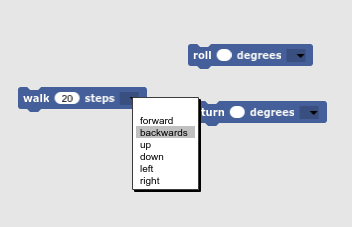 Change "backwards" to "back" in the walk block.